Welcome back to another open and honest review of a Leading SEO Product we continue to use here at VideoSeoSevices.com for the majority of our analysis and research. This is an incredible piece of software we’ve been using since 2009 called Traffic Travis. Traffic Travis is one of the absolute best All-in-one SEO Software Suits with a free version and a professional, paid upgrade version. Perform a full SEO health check on any website. Uncover technical mistakes that may affect your rankings. Find out why competitors outrank you, then beat them! Keep tabs on your competitors to spot keywords you should target. Monitor your search engine rankings so you know where to focus your efforts. Find respected link partners and build quality backlinks, easier. In the PPC section of Traffic Travis you can research an enormous amount of useful data to really improve your PPC costs and performance. Depending on the keyword phrases, it can sometimes take weeks or months to rank organically with SEO. So it can be good idea to use PPC to get in front of your target audience within a day or two. Traffic Travis continues to be a leader in the SEO and PPC Software Industry with literally hundreds of thousands of people using it. Because it works and offers great value! Back in 2009/2010, we had a small portfolio of niche websites. We decided to do SEO on the sites to get more traffic. It worked, and it made us money. But we made a huge mistake and unwittingly used a number of spammy backlinks. Our websites were penalized by one of Google’s Updates. This is when we learned about “QUALITY” over “QUANTITY”! And then we came across Traffic Travis: an SEO and PPC software suite. It looked good, and with a 60-day money back guarantee, We figured we had nothing to lose. We have not looked back since! 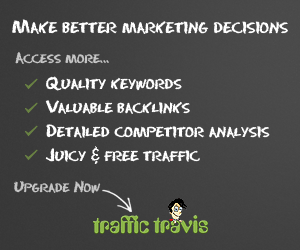 Traffic Travis has revolutionized our SEO strategy by making it effortless to find high-quality, relevant backlinks. We can find profitable keywords easily, and it makes on-site optimization simple, too. But before you get it, there are some things you should know first, so keep reading our review. We used to be confused as to why our competitors ranked better than us. We didn’t know where they got their backlinks from, so we spent weeks trying to find amazing, relevant backlinks. It didn’t work. Then we learned the secret to SEO: if you can’t beat ’em, join ’em. Traffic Travis lets you spy on your competitors, and figure out what their backlinks are. You can then go and take those backlinks for yourself! When we learned this, SEO suddenly made sense. You might be thinking this now: if I simply copy the backlinks my competitors have, how will I get an edge and rise up above them in Google? That is a good question, and I’ll tell you how: on-site optimization! Traffic Travis will do an SEO website audit and tell you what fixes you need to make. One of our websites got a “C” ranking initially, and after fixing all of the problems it had, it got an “A+” ranking with Traffic Travis! Don’t Know Which Keywords to Target? Have you ever noticed that some keywords seem easier to rank for than others? That is because some are harder than others. If you pick an easy keyword, you can rank quickly, and make money faster. If you pick a hard keyword, it could take you months before you see a return. Don’t know how to pick them? Then pick up Traffic Travis. It has a keyword research tool that tells you how easy a keyword is before you invest months of time/money into ranking for it. The included rank-tracking software makes it easy to monitor your rankings for each keyword too. Traffic Travis has two versions: the free version, and the professional version. The free version has several limitations. The free version only lets you see 100 of your competitors’ backlinks. To do the strategy I discussed earlier in this review, you need to see all of their backlinks, which only the professional version shows. The professional version also lets you track the rankings of unlimited websites (including your competitors’) and it gives you more accurate keyword difficulty readings. If you are serious about SEO, the free version isn’t enough. You need the professional version. An onsite SEO audit tool. An advanced keyword competition analyzer tool. Plus lots of other awesome features. Ready To Upload Your Videos? Videoseoservices.com is a safe website.